Tumblr is a well-known platform for micro-blogging that also acts as a social media app. The site enables users to publish all kind of contents like photos, videos, audios, text, and link as well as interact with others. It is really simple, easy to understand and completely free. If you use Tumblr often, you’re likely to come across awesome videos and GIFs that you want to save to your iPhone. However, just like most social media platforms, Tumblr doesn’t allow you to download files directly to your iPhone. Is there any way to save Tumblr videos on iPhone? Thankfully, there are several workaround that can help you do it with ease. In this article, we will show you 3 different ways to download videos and GIFs from Tumblr to iPhone or iPad. Let’s get started. DoDa-HD is a video downloader app that can be used to download videos from YouTube, Facebook, Twitter and Tumblr to your iPhone/iPad. Please note, the app is made by an unverified third-party and not available on the App Store. Please follow the steps mentioned below to get this app and then download your favorite videos from Tumblr. On your iPhone, open Safari and go to http://utp.pw. Then tap on the “Download on the new app” button to download and install the DoDa app on your device. After installation, go to Settings > General > Profiles & Device Management. Trust “ddid co…” under the Enterprise app section and make DoDa HD becomes usable. Now open DoDa HD and log into Tumblr app (we suggest you use a secondary account instead of the one you usually use). Search the video that you want to download and play it. The DoDa app will show you the option to save the Tumblr video. 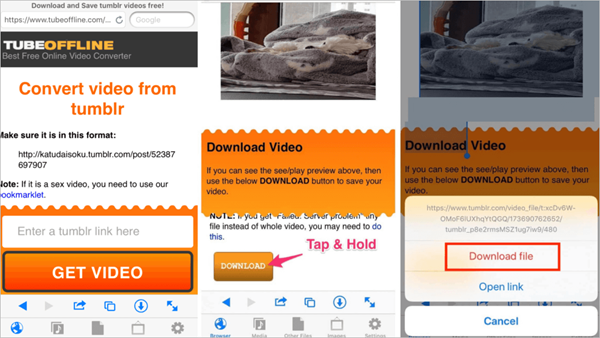 After downloading, tap on the hamburger menu icon on the top-left corner to open the navigation drawer, then select “Downloaded Video”. 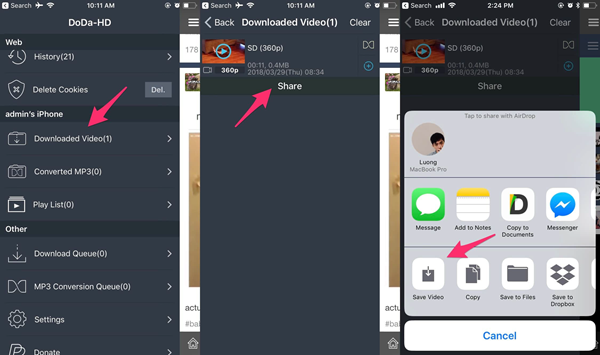 Tap on the “Share” button and select “Save Video”to save the downloaded video your iPhone Camera Roll. Open the Tumblr app and find the video you’d like to download. Tap on the Share button and select “Copy” to copy the video’s link to your iPhone’s clipboard. Open the MyMedia app and go to a Tumblr video downloader website like TubeOffline in the web browser, then paste the link you copied into the box. Click the “Get Video” button and wait for the site to convert. After that, tap and hold the “Download” button, then click on “Download file” option to start downloading. Now, open the “Media” tab to find the downloaded video. Then tap and hold on the video file and select “Save to Camera Roll”to save Tumblr video to iPhone. On your iPhone, open Cydia and go to the BigBoss repository. Search for Dwnldr and purchase it on your device. After purchasing, install it and restart your iPhone. Now open the Tumblr app and find the video or GIFs you want to download. 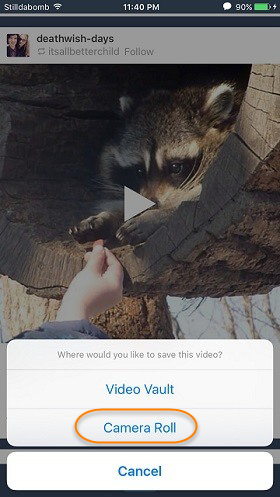 Tap and hold the video, you will see a pop-up with 2 options: Video Vault and Camera Roll. Choose the Camera Roll option and the Tumblr video will be downloaded and saved to your iPhone Camera Roll. If you prefer to download Tumblr videos on your computer, Gihosoft Free Video Converter is a great choice. This site also supports video downloading from many other popular sources such as YouTube, Facebook, Instagram, Twitter, etc. In addition, you can easily convert the downloaded videos to any format like MP4, MKV, AVI, WMV, and MOV as you like. Browse the video you want to download on Tumblr. Click the Arrow icon and select Permalink to open the post in another tab, then copy its URL from the address bar. Download, install and run Gihosoft Free Video Converter on your computer, then click “+Paste URL” to paste the link you copied. The program will analyze the link automatically. After the link is parsed, choose your preferred video format, resolution and saving location for the Tumblr video, then click on “Download”.